Buzz: Wednesday Night Whinos at Restaurant Alba! 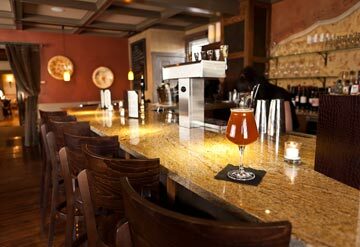 Alba’s brand new bar is the coziest setting for the March 7th Wednesday Night Whinos! Wednesday Night Whinos, AroundMainLine.com’s popular ladies social club, will celebrate our second anniversary on Wednesday, March 7th at Malvern’s Restaurant Alba! With a brand new cozy bar, Alba, formerly a BYO, is now a full service restaurant. Since this Whinos will be a birthday celebration of the founding of Whinos in March of 2010, we have put together a really special evening in conjunction with Executive Chef Sean Weinberg and his lovely wife Kelly (also the owners of Alba). The theme for the evening will be ‘A Taste of Italy.’ Chef Weinberg will be creatively pairing complimentary appetizers with Italian beers and Italian wines for a gourmand girl’s dream experience! A cash bar will be available as well. As with all Whinos, business casual attire is highly recommended as we gather to meet and network with the region’s top businesswomen and great gals. Absolutely no jeans or sweatpants are permitted. RSVP is not required—we always welcome walk-ins to Whinos—but it does greatly help us to plan accordingly with our generous host, Restaurant Alba. A new concept we are introducing to each Whinos starting with this March event is ‘Featured Female Entrepreneurs.’ We will highlight one or two local business owners or artists as the special guests of the evening. For the March Whinos, our two featured entrepreneurs are local Etsy artist Kristen Stein and Malvern boutique owner Martha Saphier Philpott of Nota Bene Boutique! Both ladies will be at Alba displaying their fashion, accessories and art for Whinos to purchase—along with some very fun giveaways for two lucky ladies. Restaurant Alba is located at 7 West King Street in Malvern. To make reservations call 610-644-4009 or visit them on OpenTable.